Meanderings: My dog walks in circles. Not just when she is getting ready to bed down or when she is attending to the other necessities of dog life…. She circles all the time. 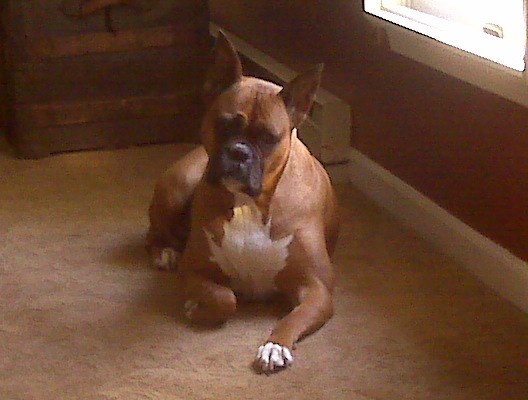 My sweet brown Daisy dog, a 10-year old boxer, has a brain tumour. It is a slow grower…enough to interfere with some of her functions, but not enough to cause her death at this point. The tumour makes her a bit neurotic. Her circuitous walks can take her places she does not mean to go, and it is easy for her to become disoriented and get lost in her own back yard. I will always go find her and bring her back to shelter. Daisy also can obsess easily, only stopping when we physically stop her and interfere with her patterns. In the grip of her fixations, she may “tell” us it is time to eat an hour before she is supposed to. 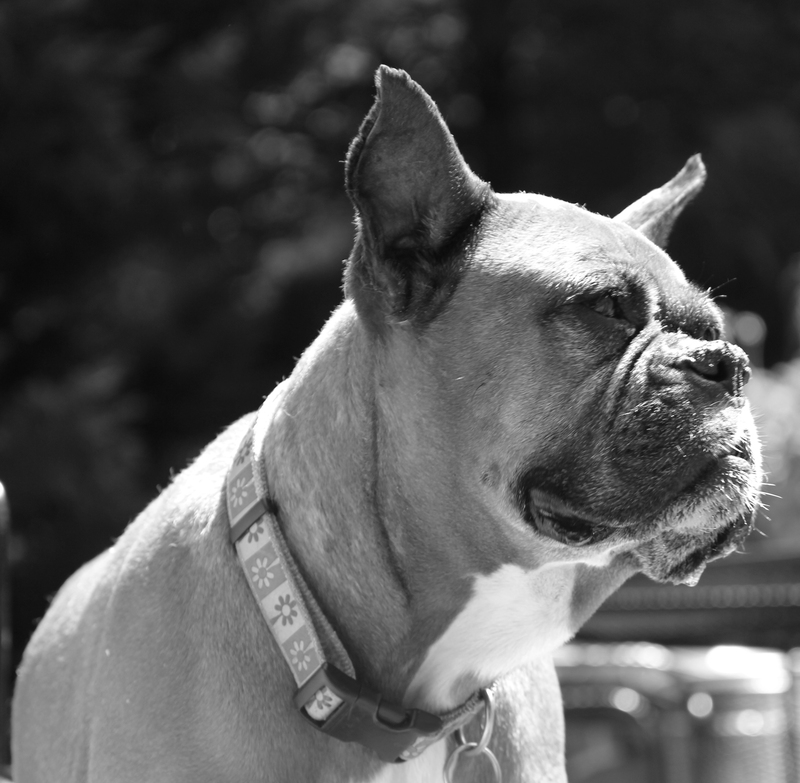 She will get in your face and distract you endlessly until you “hear” her and what she wants (boxers rarely bark, so they have their own form of “non-verbal” communication). Her circling sometimes causes her to step in her food, her water bowl, and some not-so-pleasant detritus in the woods around our house – at least once a day the paper towels come into play as her feet, her mouth, and her fur may need to be scrubbed off for some offending residue or the like. She is indeed “special needs,” but she eats well, sleeps well and loves her people well. She is very dear to us. We love her. This morning she walked into her water dish which toppled her food on the deck, which she slid in and ended up with a shmear of shmutz all up and over her pushed in nose. Yikes! She was a mess. I came to her rescue for the 100th time, wiping her up and sorting it all out. I could see she was embarrassed, and once I got it all managed, I gave her some extra time to cuddle and calm down. As I was doing so, I started thinking about how much she relies on me to care for her. She has become so domesticated, unlike her canis lupus brethren, she could likely not survive on her own, especially in this unwell state. I could see that her foot was sore, as one leg is stiff from the pressure of the tumour on the side of the brain that controls that leg. I rubbed it and assured her. She needed that extra touch. She needed to feel safe and well and loved and forgiven for the muddle she created. Daisy is not unlike most people. Crooked Paths: Don’t we often walk in circles in our own lives, repeating mistakes, obsessing over them? I know my circles, the repetition of making the same mistakes over and over….my feet frequently carry me where I don’t want to go. I step into things that weren’t meant for me and my mouth get’s “dirty” when I use my words in a sharp manner and leave an unintended effect. Indeed, there are many times, because of the bad choices I make, my whole self needs to be washed and cleansed for another day. Surprisingly, sometimes I am not particularly verbal, instead holding in my “stuff”, mulling, chewing, worrying….and again, making an unholy drama when I decide to take control. I have tried many times in my life and for many years, to survive on my own. But in doing so, I have continuously put myself in a state of affliction and found myself sore and tired and needing God’s love and His extra forgiving touch. Straight paths: I thank God today and every day, that I am learning to get off the treadmill, to stop walking in circles. I know that the straight road to Jesus is the best way. He will guide me and not let me get lost, and if I do, He will search me out. He is my gate; I am to “Enter by the narrow gate; for wide is the gate and broad is the way that leads to destruction, and there are many who go in by it. 14 Because[a] narrow is the gate and difficult is the way which leads to life, and there are few who find it. I am thankful that He will stop me in my destructive patterns and find me, the prodigal daughter, when I get lost. I appreciate the wisdom of Jesus when He tells me, Apart from Me you can do nothing. I recognize the importance of coming to Him to “clean” me up, that If we confess our sins, he is faithful and just to forgive us our sins and to cleanse us from all unrighteousness. I am so thankful that He is steadfast and that the love of the Lord never ceases, his mercies never come to an end; they are new every morning; great is [His] faithfulness. I am learning why it is important to sit quietly and let Him minister to me and heal my hurts and wounds, whether self-inflicted or not. So in the end I guess, I am not unlike my Daisy. I am sick and broken and lost and willful and frequently confused and maybe even a bit neurotic…and I too have a place to go to be sheltered from all of it – and someone who loves me even with all my shortcomings. I also have a special need, one that can only be met by my Jesus. love to daisy. i remember her with fondness.